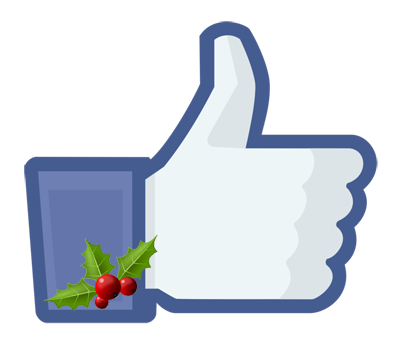 If a friend, relative, or valued service provider has a website, give them the gift of a business Facebook “like” this Holiday season. This act is free and will literally take you 30 seconds or less. By doing so, you help your friend or relative further establish business credibility and trust from an online standpoint. Why do this? The reason is simple. Facebook “likes” is something that business owners can refer to promote their business popularity and interaction with their clients. It is also a widely accepted conclusion that Facebook “likes” play some role in how a website converts visitors into customers. So if you know anyone with a website and wish them well in business, take 30-seconds and “like” their business Facebook page. Look for the Facebook logo usually located at the top or bottom of the website’s home page. Then shoot them a quick note saying, “Happy Holidays. I recently “liked” your business Facebook page and wish you continued business success in 2018 and beyond”. It would be a kind gesture and one that cost you nothing other than 30 seconds of your time. To all our regular readers of this blog, we wish you all Happy Holidays and only the best for 2018 and beyond.